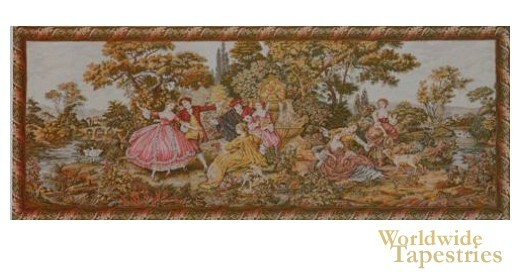 Scenes Galantes tapestry shows a countryside scene based on the work of Francois Boucher. Boucher, court painter of Louis XV, produced works portraying the life in the countryside full of romanticism. here we see a couple dancing as well as nobility playing with their pet dog. Rich foliage of plants and trees decorate the entire scene, placing an emphasis on the natural beauty in the scene. The Scenes Galantes tapestry is backed with lining and tunnel for easy hanging.